Home to some of the most juicy Kalamata olives and tastiest olive oil around, gorgeous Oakhurst is well worth a visit. They do daily tastings during which you get to smell and sample the products, including the delicious tapenade made using a secret recipe which you’ll merrily lap up using their delicious home-baked bread. It's of course made using Oakhurst olive oil and is some of the best bread we’ve ever tried! The tasting room is a bright, modern space and art lovers should take the time to walk around to admire the various pieces on the walls created by the owner’s daughter. Take a stroll on the grounds after – they’re particularly colorful in the springtime. Take home: one of the nifty 1 litre bottles of olive oil – our favourite is the Oakhurst Extra Virgin Olive. The “tap design” means the oil stays fresher for longer as very little air is able to get in (compared to the usual twist caps). Perhaps one of the lesser known of the Cape Winelands routes, the Tulbagh Wine Route can certainly hold its own. A number of award-winning estates dot the way, from Krone @ Twee Jonge Gezellen, to Drostdy-Hof Wines and Museum, Montpellier, Waverley Hills, Blue Crane Vineyards and Rijk’s Cellar. Sip your way from one to the next, taking in the gorgeous mountain views along the way. Pop by: Saronsberg not only for a tasting (their Saronsberg Six Point Three Straw Wine 2008 is particularly delicious for a sweet little pick-me-up...), but also to take a look at their gallery. It features a number of notable artists, including works by Paul Klee. Once you’re done wandering around inside, take a walk in the gardens and check out the sculptures there too. This part of the world is known for its selection of yummy dried fruit and when you’re in Tulbagh you’re able to find a bag of your favourites almost anywhere. A visit to Tulbagh Dried Fruit is a must for excellently-priced, simple and delicious sweet bits. A gravel road leads you to the little farmhouse where you can go in and gather your goodies in one of the baskets provided. There’s everything from prunes, to peaches, apples, pears, dates and more. Pick up: some farm fresh eggs too while you’re there. If there’s one thing Tulbagh has, it’s a rich history. A guided walking tour of historic Church Street introduces you to the various Victorian and Cape Dutch homes that have since been converted into small museums, each symbolising a part of the town’s character and past. Learn about the earthquake that rocked Tulbagh back in 1969, visit the Oude Kerk where you can see the original yellowwood pulpit and take a stroll through the Community Gardens – the entire street has been declared a National Monument making it a truly fascinating place to explore. Stop for: a spot of lunch at Reader’s Restaurant along the way. Originally the first school in the town, it’s now a popular restaurant serving hearty meals, many with a South African twist. The more adventurous may want to try the wildebeest with gooseberry and Amarula sauce. Tulbagh and its surrounds are home to some amazing hiking trails and this can be a great way to get out into nature and really appreciate the incredible landscape. There is a selection of walks of varying distances and difficulties so you’re bound to find at least one that works for you. This is easily one of the best ways to see the wild lilies that grow abundantly in the area – they’re something special. For those more into the bike, there are mountain biking trails too. When the weather’s warm: we love the Waterfall Hiking Trail. A short walk leads you to a waterfall and rock pools – perfect for that cooling dip when the temperature rises. Permits are available at the Tourist Office for R10p/p. This elegant boutique hotel is where old-world country charm meets contemporary style. Friendly and welcoming staff take care of you from the moment you walk through the door, ensuring your stay is comfortable and carefree. The gorgeous rooms manage to be spacious and cosy at the same time, with a mix of antique pieces and modern touches. And the food? The Olive Terrace serves scrumptious dishes that can be enjoyed in the inviting dining room or if the weather is good, outside on the leafy terrace. The pizzas are mouth-watering and the smoked salmon trout fillet served on a quinoa and lentil salad is to die for. And don’t even get us started about the chocolate fondant… The relaxed environment will make you feel instantly at home and it’s the ideal space from which to get an authentic taste of Tulbagh. Click here to book your stay at The Tulbagh Hotel. There’s so much on offer in charming Tulbagh so whether you’re looking for an adventure-filled getaway or just a romantic weekend away, it promises to deliver. PS: Adrenaline junkies shouldn’t miss out on the chance to go zip-lining in nearby Ceres. 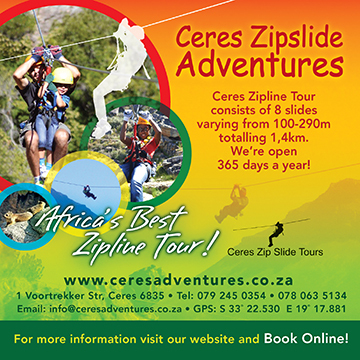 Ceres Zip Slide Tours will take you across eight slides (for 1.4km) through the beautiful Schuweberg Mountains. Experienced guides ensure you feel safe every step of the way, so if you’re keen to get a glimpse of things from above at high speed, this is definitely the activity for you.